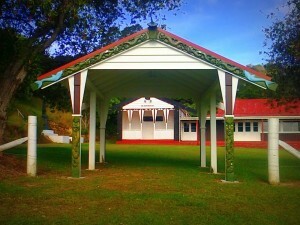 Waka Toi of the Queen Elizabeth Arts Council gave the Te Rawhiti Marae Trust under the supervision of Elizabeth Mountain Ellis $25,000 to refurbish the Wharehui carvings and build and embellish the tomohanga (gateway) in 2006. The work was finished by a team under Fred Higgison in 2013. 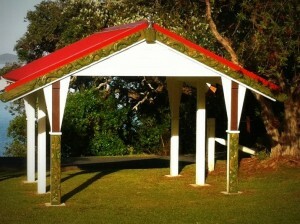 Kaumatua Moka Puru provided the overall design concept and completed the majority of the carving. There are two carvings, the outer one facing the road as the Entrance façade, and the inner one facing those who are leaving. 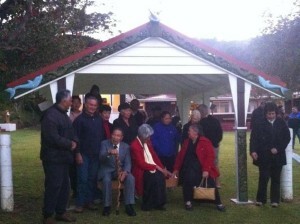 Moka Puru’s nephew, Hohepa Hemara completed the inner carving. The Entrance carving tells the Ngati Kuta story of their arrival at Te Rawhiti and the kaitiaki, guardians, of Ngati Kuta The inner Exit carvings tell the Patukeha hapu story-their arrival in Te Rawhiti and their kaitiaki. This new gateway is part of a new development plan – Fred Higgison is redesigning the renovation scaling down the project to something Te Rawhiti can afford in small stages. 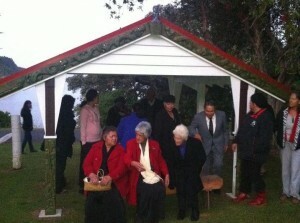 He is Rangi Hakaraia and Ron Higgison’s son and the committee are very grateful for his work. We will publish the drawings as soon as they’re available.